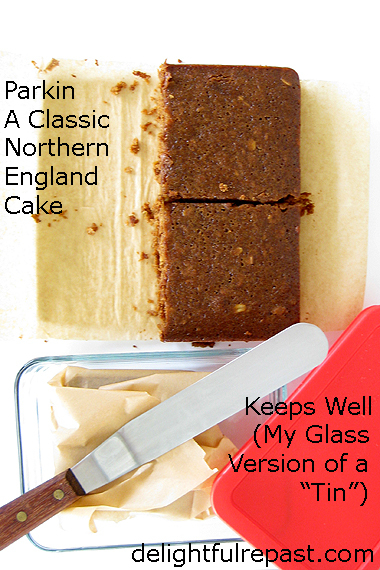 Parkin is, I think, generally considered a Yorkshire thing; but some say it's a Lancashire thing. So let's just call it a Northern (England, that is) thing. It makes me think of my grandfather, who was from right on the border of Lancashire and Yorkshire. There are similar cakes from much earlier, but Parkin has been around at least since the 18th century; so I like to think of it as a Georgian thing. It's sort of a gingerbread with the addition of oats. There are all sorts of formulations, but I like to use an equal weight of butter, flour and oats. It's definitely a make-ahead thing because it improves with age. You should wait a few days, and some say a few weeks, to eat it. I've never tried to keep it for a few weeks; have you? But I like to give it at least a few days for the spices to mellow and the cake to get stickier. This has a lot of sugar (three forms of it), less than some recipes, but still a lot. But it's cut into 16 squares so comes in under my self-imposed daily sugar allowance. I'll be experimenting with cutting back more on the sugar and will keep you posted. I'm also going to be experimenting with "mellowing" times. I've cut this into 4 squares, so I can wrap it up in portions to be tested at 1 day, 3 days, 1 week and 2 weeks. If you don't already have a wonderful family Parkin recipe, I hope you'll give mine a try and let me know what you think. Update 09/26/17: Though it "kept" for a week, I don't think it improved in any way. And it was great on the very first day. So I won't be waiting to eat it, but am happy it does keep well, making it ideal for packed lunches for work or school. Can be eaten right away but is said to improve when wrapped and stored for anywhere from 3 days to 3 weeks. I cut this one into 4 squares in order to test different storage times. Stay tuned for the results! ﻿Don't forget to Pin it! 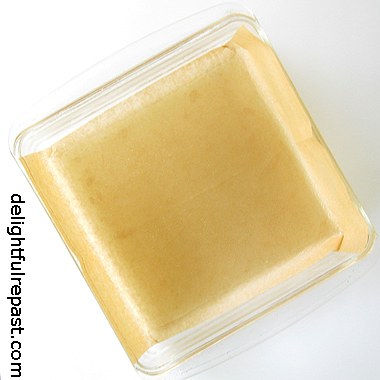 1 Grease 8x8x2-inch/20x20cm baking dish or tin with butter or spray it with cooking spray; line the bottom* with parchment paper, and grease or spray it as well. Preheat oven to 275F/135C/Gas1. * I tear off a 7.5-inch piece of baking parchment that is 13 inches wide so that it covers two of the sides with a bit of an overhang to make it easy to just lift out of the pan after running a knife along the two "bare" sides. 2 In 3-quart saucepan, melt together the butter, sugar, honey or golden syrup, and molasses or black treacle. Remove from heat as soon as melted together--do not boil--and cool slightly. 3 In 1.5-quart bowl, whisk together oats, flour, baking powder, salt and spices. 4 Add dry mixture to saucepan, along with beaten eggs and milk, and stir until well combined. Pour into prepared tin and bake for about 1 1/4 hours, or until cake is firm in the center and pulling away from the sides of the pan. 5 Cool in pan on wire rack for about 15 minutes before turning out onto wire rack, removing parchment and turning cake topside up to finish cooling on wire rack. Or, if you've lined the bottom with an overhang, just run a knife along the two unlined edges and lift the parkin out of the pan. Wrap the thoroughly cooled cake in baking parchment and then in foil and store for at least 3 days or up to 1 week* before cutting into 16 squares. * Some people let their parkin age for about 3 weeks before cutting it, but I've never tried it. This is new to me, but if it's like Yorkshire pudding, then I am sure I will love it too. Lots of sugar, but a small bite won't hurt! I've never heard of Parkin, Jean. It looks similar to gingerbread, and I just know that I'd love it with all the spices included, and old fashioioned oats,too. I must make this soon! It would be perfect with a cup of tea. Angie, that's what I figure - and since I eat so little sugar, I don't have sugar cravings, so it doesn't bother me a bit to have just a small serving of something. Thanks, Kitty. Yes, it's like an oatmeal gingerbread. It was traditionally made starting in November just after the oat harvest. Your England cake looks delicious,perfect for tea time.Love your beautiful teaset,as ever...Have a lovely day,Jean! The English always come up with the most delicious treats to accompany their tea. I'm also a fan of the pretty purple (violets?) chintz snack set! Sully, sounds like just the cake for you then. Plus it is quick and easy! And if you're looking to gooey it up some more, just pour on some warm toffee sauce and plop on a big scoop of ice cream. Jean, I was going to say that the cake sounds like an oatmeal gingerbread cake but someone else beat me to it. I am quite curious about this one. I have never heard of it before and I wonder if my British born uncle who passed a few months ago had ever eaten it. Sounds like a good cake that gets better as it ages. I think a toffee sauce and ice cream would really make it quite special. I'll keep this one in mind. Thanks for the recipe. Oh Dawn, I knew I could count on you to have had parkin! I'm not sure mine is as good as your grandma's, but I'll have to make do! Sandi, if your uncle was from the south, he may not have ever heard of it. But if he was from the north, there's a good chance! That's very nice looking parkin. Parkin is always very welcome in the winter - there's something warming about it. It's my favourite thing to take on a winter walk to keep me going - well, along with a little sloe gin maybe. I'm not entirely convinced by what people say about the improvement with storage. It certainly gets stickier after a few days and that's not a bad thing but beyond that I'm less sure. But I'm probably in a minority who think that way. Judy, that's wonderful! And I knew you wouldn't just abandon Tommy and Smokey! Can't wait to hear all about it. Oh yes! Tomorrow - first thing - making this! But how will I ever wait for a couple of days to eat it! I loved that you wrote it will become sticker so maybe that will keep me out of it. I haven't heard of it before but love all things gingerbread-like and love oatmeal in bread/cakes too. So... this is going to be a keeper! 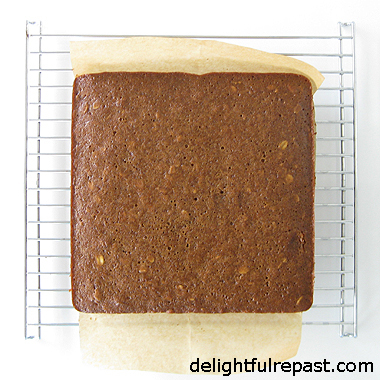 Parkin is a new word for me, and it sounds like a delicious cake for cold weather snacking! Dear Lily, no, you really don't need to wait; like another commenter, Phil, said, I'm not at all sure there's any real improvement. I think that might be the case with the recipes that are heavier on the sugars, and just plain heavier, than mine. I'm so glad you like my recipes! I thought of you this morning when I began thinking about the huge batch of Mexican rice I'm making tomorrow for an event - double my usual big batch, so four pounds of raw rice. Hugs! Thank you, Lorrie. Yes, I think it's perfect for fall and winter snacking. I hope you'll try it soon. I've never heard of a parkin cake! It reminds me of a gingerbread cake I make around the holiday. Looks delicious. Thanks, Melissa. It's like gingerbread with oatmeal. Great with tea! Jean - I have never heard of a parkin before, but it sounds an awful lot like my mother's spice cake. Will need to compare the recipes and see... maybe I HAVE heard of a Parkin and didn't know it! Wow this looks and sounds yummy! Thanks for sharing the recipe greatly appreciated! What a great combination -- gingerbread and oatmeal cake. It looks extremely moist -- just the type of cake I like. Also, without a heavy frosting or icing you can get the true flavor of the cake. Well, I just learned about a new dessert -- Parkin Cake! I've pinned it. Have a great weekend. David, many cultures probably have a similar cake, but one known as parkin is a regional thing. Perhaps it's not really known outside of northern England. Would be funny if your mother's recipe is titled "Parkin" and you never noticed it! Thanks, Whitney. It goes beautifully with a cup of tea. Thanks, Marisa. AND thanks for the Pin. I like all cakes without frosting and only ever frost cakes for guests or special occasions. I love all of these spices and the rich, moist look to this cake so even though I've not heard of it, I'm pretty sure it's something I'd enjoy! Thanks, Lauren. It's definitely an autumn cake. Jean! You have a talent for coming up with recipes I didn't even know I'd forgotten about. My grandmother lived in Warrington and made this; she also had at least two variants of ginger bread / ginger cake. Autumn is the perfect time of year to be reminded of this kind of spiced, oaty treat. Wonderful. Saving to make this soon. Pauline, thanks for weighing in on this. I love things people's grandmothers made. Let me know if my recipe lives up to the memory! All done and dusted, Jean! The cake is baked, cooled and almost all of it is double wrapped to wait for tomorrow. ; ) Well, we had to have a little taste and it is delicious. The combination of the three "sugars" produced a wonderfully different flavor than I could imagine they would. (I used honey and molasses with the brown sugar.) This recipe will be perfect for an autumn or winter tea when a little spice in the cake would be just right. And it will be so nice to be able to make it a day or two in advance so there is more time to prepare other items on the day. Just yesterday we had put our regular oatmeal on our shopping list but instead we will get Bob's Red Mill and give it a try. Bet it's good. Now, how did your BIG recipe of rice turn our? I thought about you making it while I was baking up the Parkin. Oh, I loved hearing back on how the rice worked for you today! Isn't it wonderful when a plan comes together. I can just see your stove top filled right up with only one burner unused. Well Done, Jean! I bet people really loved your rice! We made rice again this week. It is so great to have "money in the bank" packages of Mexican Rice ready to use when the need arises. Thanks, Lily. My freezer stock of rice is gone, and my main dishes for two are down to three; so I have to get busy stocking my freezer again. Thanks, Nicola. It's a quick and easy cake that even busy mums can manage! I have had my "cheesecake" folder out on the counter for weeks. It is time. Your looks wonderful in deed. Thanks for sharing another great recipe! New to me but I'm intrigued. Why, thank you, Ellen. I like giving readers something intriguing! Jean, Thanks for sharing this cake. Have a great week. Sylvia D.
Thank you, Sylvia. I've been trying to comment on your blog for days now and keep running into a glitch. Oh goodness...haven't thought about Parkin in years! My father-in-law was from Yorkshire and my husband grew up with it, although my family, from Leicester didn't. Was often and his mom's home though. Lovely reminder. Love the violets snack set too! Thanks so much for linking to Tuesday Cuppa Tea. Ruth, thank you. I just love how England has so many regional specialties that are not made, or sometimes even heard of, just a short distance away. Thank you so much for dropping by my last blog post and farewell to leave such kind comments. I must be sure to visit you from time to time to catch up on all your delicious recipes. 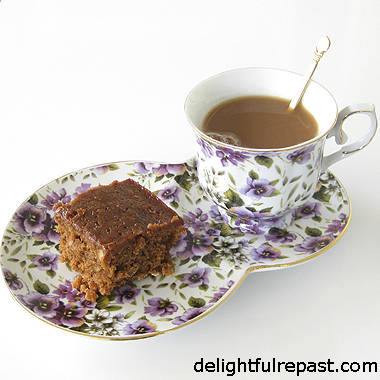 I think Parkin cake would be a wonderful addition to my afternoon tea recipes. Thank you so much, Judith. And I do hope you will pop in from time to time. I know so many, especially those of us who blog a lot about tea, are really going to miss you! Your Parkin post took me back to the times when my Grandmother, a Lancashire lady, made Parkin. It always seemed to be in November and we used to eat it on Fireworks Night (Nov 5th). I've often eaten Parkin, Jean. I love ginger cake. You are becoming more English than the English, Jean. Elizabeth, thank you for weighing in on this! My grandmother was a Northern lass as well, from the Lake District. Thanks, Tony. Friends from Yorkshire told me that decades ago! It's not a recent development. I grew up with lots of tea and great British baking, etc. Hi sweet friend. This looks delicious and is "new" to me. It is especially pretty on your gorgeous china. Happy Autumn! Dear Mildred, thank you. We like our pretty china and pretty cats, don't we?! I have never had a Parkin cake but it sure looks good. Wonderful warm fall spice mix that is perfect for afternoon tea. I will sure be trying this recipe. Thanks so much for sharing with us at Full Plate Thursday. Hope you have a great week and come back to see us real soon! Thank you so much, Miz Helen! I hope you'll try it soon. Looking forward to the next Full Plate Thursday! I don't think your delicious recipe for Parkin would last 2 weeks around here, Jean. It would be long gone by then! Your Parkin looks delicious. I've seen it in bakeries in Northern England and it looks just like yours. It's a delicious treat, and I'm so glad you have shared your recipe with us. I've featured it at the Hearth and Soul Link Party this week. Thank you so much for sharing it! April, thanks so much. You're right, I couldn't make even one little piece last the 2 weeks for my test! Thank you for the feature! I never heard of this cake before but I like all the ingredients and spices. I will save this recipe for a rainy cold day. I'd never heard of Parkin cake till this but it has all the flavors I really like and I think I'd appreciate the heartiness and health that the oats add. I love the idea that it can last for two weeks -- although I'm not sure how realistic that is if it's as good as it looks! Gerlinde, that sounds wonderful - parkin on a rainy cold day! Jeanie, I have no personal experience with it lasting two weeks! But I did manage to keep one piece for a week, and it was fine. Miz Helen, thank you so much! I really appreciate it! And I'll see you tomorrow at Full Plate Thursday. Sounds so very yummy! Thanks for sharing the recipe with SYC. Thank you, Jann! And I hope you're feeling better every day! Interesting recipe and info. I don't think it's one I'll try, but liked learning about it. Thanks, Sugar. It's really similar to gingerbread, and my husband is not a fan of either. He eats it, but he would prefer something else! I love parkin! It's the perfect thing to bake at this time of year. Thanks, Caroline. Didn't know if it would be known in Berkshire! With no clue how I arrived, am delighted to be here! 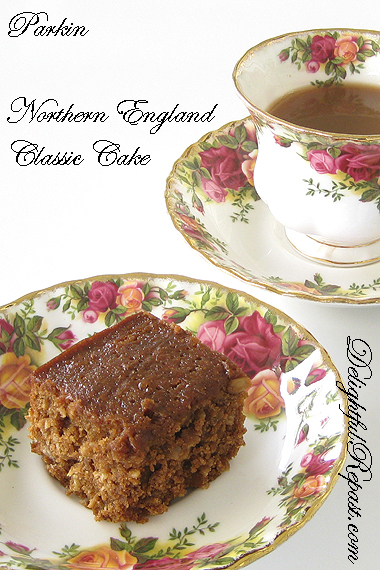 This cake looks the perfect treat with the Yorkshire tea purchased earlier this year in the Lake District. When asked about "other" teas, the young lad responded, "BAH! The *only* tea is Yorkshire tea!" He was cute as a jar full of buttons! Sandra, thank you so much - I hope you'll come back! I love Yorkshire tea, too. But, unlike the cute lad, I drink other brands as well! Just wanted to tell you that try as we might to make it last, our cake for the two of us was gone in just 6 days! We had 1/12th serving size instead of your 1/16th. We are just weak! It was so good and will be made again for the days between Thanksgiving and Christmas. I made a light custard sauce to pour over it warmed and it reminded me a lot of the plum pudding my mother used to make. It was a very sweet memory to enjoy. Thank you. I am hoping to make this, but probably after Christmas, Jean. I want to make it in my mini cottage bundt pans. I know I'll love it! Kitty, I can't wait to see my Parkin in your mini cottage bundt pans!